A true entertainer is in no need of fancy footwork to achieve a memorable performance. On Friday afternoon, performers across the world celebrated “Dance Anywhere,” a simultaneous, unplanned public performance. The San Francisco Museum of Modern Art hosted a performance of two dancers from AXIS Dance Company in commemoration of the day. AXIS, an Oakland-based nonprofit founded in 1987, features physically disabled and able-bodied performers who specialize in physically integrated dance. This form of contemporary dance emphasizes the role of the disabled performer while also challenging people’s perceptions of the human body and the traditional notion of dancing. Giles, who has been with AXIS since 2005, often performs with Rodney Bell, who is paraplegic. Bell is originally from Te Kuiti, New Zealand and played basketball for the country’s Paralympic team from 1999 to 2006. In the spirit of Dance Anywhere’s “no boundaries” philosophy, Giles and Bell performed “To Color Me Different” to onlookers in the SFMOMA lobby. Bell was not confined to sitting. At times, he would leave his wheelchair and crawl across the museum floor, sometimes embracing his partner. Other times he would make use of the wheelchair, lifting it and utilizing his upper body strength, to perform an intricate pose. In turn, Giles would grab her partner and, while performing traditional dance, often used Bell’s back as a springboard to emphasize her flexibility with Bell wheeling about–all done in the name of artistic expression. The performance was without any musical or audio accompaniment. While many SFMOMA patrons milled about the lobby, others encircled the two performers, studying their physicality. 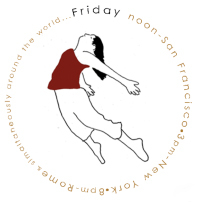 In regards to the day itself, 12 p.m. marked a flurry of spontaneous performances courtesy of the Dance Anywhere organization. Dance Anywhere arranged for the AXIS performance to perform at SFMOMA but many other individuals and organizations throughout the world also participated in the annual spontaneous performances. While other spontaneous dancing events occurred throughout the Bay Area and in San Francisco–including a performance at United Nations Plaza- it was AXIS who captivated many within SFMOMA because of its alternative take of dance. Photo details: Sonsheree Giles and Rodney Bell, dancers part of the Axis Dance Company, perform “To Color Me Different” choreographed by Alex Keltley at the SFMoma on Friday March 18, 2011.